andrew hutchinsonSue Lee Miniature Collection of paintings, fine art in miniature. Contemporary Miniature paintings for sale direct from the artist. 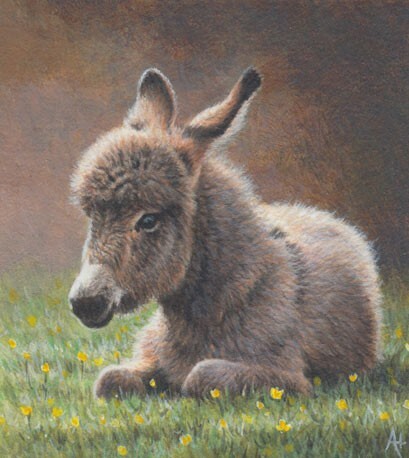 Andrew paints in acrylic on board and in 2014 he won both the "First Time Exhibitor Award" and the "Royal Miniature Society Group Award" at the Royal Society of Miniature Painters, Sculptures and Gravers (RMS) Annual Exhibition at the Mall Galleries in London. Each of the paintings for sale on this page are available in a choice of these two different framing styles - Dark Wood or Gold. If you would like to purchase a painting, please note your chosen frame when you get in touch. Original painting by Andrew Hutchinson. Supplied framed. Acrylic on board 50mm x 58mm. PURCHASE INFORMATION - Please get in touch to receive a quote for shipping (dependent on destination) and confirm framing choice. Payment can then be made via Paypal or by UK cheque. Original painting by Andrew Hutchinson. Supplied framed. Acrylic on board 70mm x 75mm. Original painting by Andrew Hutchinson. Supplied framed. Acrylic on board 65mm x 44mm. Original painting by Andrew Hutchinson. Supplied framed. Acrylic on board 90mm x 66mm. Original painting by Andrew Hutchinson. Supplied framed. Acrylic on board 67mm x 85mm. Original painting by Andrew Hutchinson. Supplied framed. Acrylic on board 67mm x57mm. Original painting by Andrew Hutchinson. Supplied framed. Acrylic on board 67mm x 65mm. Original painting by Andrew Hutchinson. Supplied framed. Acrylic on board 60mm x 84mm. Original painting by Andrew Hutchinson. Supplied framed. Acrylic on board 72mm x 65mm. Original painting by Andrew Hutchinson. Supplied framed. Acrylic on board 65mm x 48mm. Original painting by Andrew Hutchinson. Supplied framed. Acrylic on board 75mmx 65mm. A percentage from the sale of each painting will go towards the upkeep of the Sue Lee Collection. Â© Copyright Lee Miniature Collection 2014-2018 and individual artists. No work may be reproduced without written consent of artist. All rights reserved.